In the episode “A CinderHella Story” Madeline Scott (Rachelle Lefevre) and the Injustice Defense Group continue their quest to free the wrongly imprisoned and ensure justice is served. This week the accused is Adele Meyerson (Victoria Park) a young woman accused of murdering her adoptive mother. The prosecution believed Adele was the killer as they hadn’t sensed any remorse or emotion in her 911 call. But Madeline was all too familiar how 911 calls can make or break you as either they’re considered believable or they’re not. She remember how no one believe hers. Adele had been remanded to a psych ward after the murder and sustained bruises to her wrists. The Injustice Defense were curious why these seemed to be of no interest to the prosecution. Since a large inheritance was on the table, if Adele didn’t commit the murder the next possible suspects were family members. Brody (Vincent Kartheiser) questions Tessa Meyerson, the murdered woman’s sister. Tessa explains how everyone loved Adele when she was a child but as she got older, she changed and became more greedy and constantly argued with her mother. Tessa believed Adele was guilty. And as the other family member suspects have airtight alibis, the Injustice Defense Group needed to find another suspect if they have any chance of getting Adele’s conviction overturned. Gore Bellows (Kelsey Grammer) tells Madeline that he knows when someone is guilty and insists that Adele is guilty. But Madeline refuses the man who helped wrongly convict her for murder. I think that Madeline sees similarities with her own case in Adele’s and this may have clouded her judgement. Enter Professor Arthur Kauffman (JimTrue-Frost) who presents the theory that it was a serial killer murder. He even has an elaborate computer program that supports his theory based on the serial killer stalking his victims via email and getting them to respond and basically ask to be killed. Brody is able to hack into Adele’s stepmother’s email and finds emails from the serial killer suspect. And during the trial after Kauffman’s testimony, the jury finds Adele not guilty. But when Violet (Nikki M. James) interviews Adele and Kauffman for her podcast, something they say cause her to be suspicious and she leaves the mike on which reveals that Adele is guilty the killing and Kauffman’s serial killer scheme was to aid her in getting away with it. The Injustice Defense Group is shocked and angry with themselves for helping a murderer get away with her crime. There was just something about Adele the screamed guilty to me and the minute Kauffman showed up with an alternative suspect, that confirmed her guilt for me. 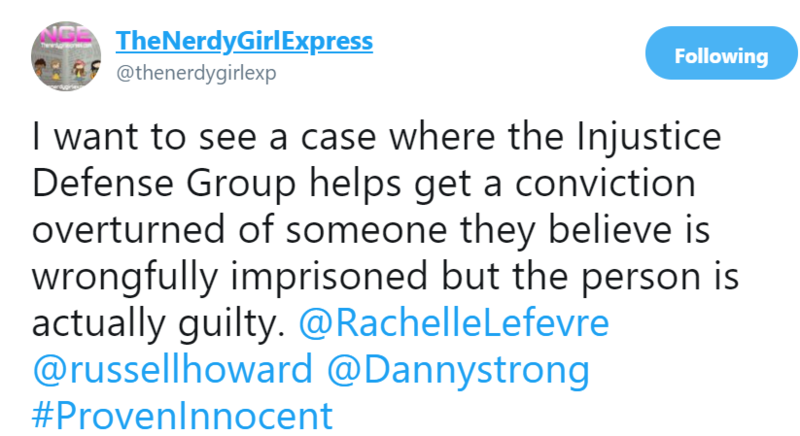 Plus I feel that having the Injustice Defense Group help a guilty person get acquitted makes for a stronger show as it will have them questioning themselves. Their mission statement is to free the wrongly accused but has this goal caused them to be blind sighted by the guilty? This is worth exploring in future episodes.